I’m not sure whether there is keyboard lover in the world, but if computer geeks want to collect a set of gadgets by keys of keyboard, it isn’t a big problem. Here is another keyboard gadget: Recycled Keyboard Notebook. Apparently the same as the keybag, keyboard notebook shows us an impressive cover assembled with the 62 keys of recycled keyboard. But notebook is still notebook, even if there are many key covered over the notebook, you can never type text on it through clicking the keys. You have to use the 88 lines pages and one non-electronic pen. 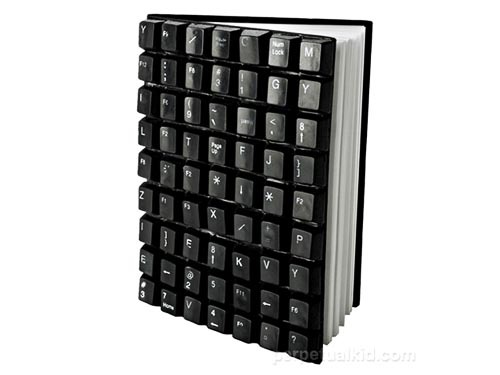 recycled keyboard notebook is priced at $16.99 USD. Perhaps it’s more suitable for collection. Perpetual kid is selling the geek-chic gadget.